Title: 09/28/1994 - A description of a retailer's responsibilities regarding material safety data sheets (MSDSs) and training under the HCS. The Honorable John J. Duncan, Jr. Thank you for your letter of August 1, requesting information regarding the Occupational Safety and Health Administration's (OSHA) Hazard Communication Standard (HCS), 29 CFR 1910.1200. You also enclosed a letter from your constituent, Steve Burgess, dated June 19, requesting a description of a retailer's responsibilities regarding material safety data sheets (MSDSs) and training under the HCS. Your constituent's comments/questions will be answered in their respective order. "What are the requirements of a retailer in maintenance and employee training of these sheets?" "Assuming these are to be used in helping the consumer in case of an emergency. What happens after the retailer's regular business hours or when the manufacturer's facility is closed on the weekend." "Seems to me that trying to utilize and maintain these sheets at the retail level is a futile waste of valuable time. This also seems to create a position for some bureaucrat." "I believe a better approach would be to create a system similar to the poison control center where the consumer can call an 800 number for an immediate response. This would allow the consumer to receive accurate information 24 hours a day. (Employees have a difficult time understanding these sheets)." The HCS does not apply to the general public. Normally, MSDS's are not required to be transmitted to retail consumers unless they request one. The purpose of OSHA's HCS is to reduce chemical source illnesses and injuries through acquisition of hazard information. This can only occur if employees receive the information on the hazardous substances they work with in usable form through appropriate training, which will enhance their ability to understand the sheets. 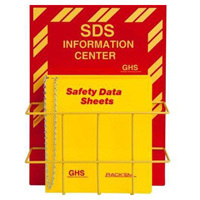 In effect, employees at a worksite with hazardous chemical must be trained on the hazardous materials they are exposed to, how to obtain and use information on labels and material safety data sheets (MSDSs), and how to follow appropriate work practices.